This delicious dish is a flavory and savory combination of ground pork, fresh vegetables, and condiments. It tastes fantastic and is very versatile. The recipe is simple and easy to follow, and you will love it if you are a fan of veggie and meat combos and stuffed bell peppers. The mouth-watering filling tastes great and is easy to make. Parmesan is a lovely addition and gives it a rich flavor and texture. 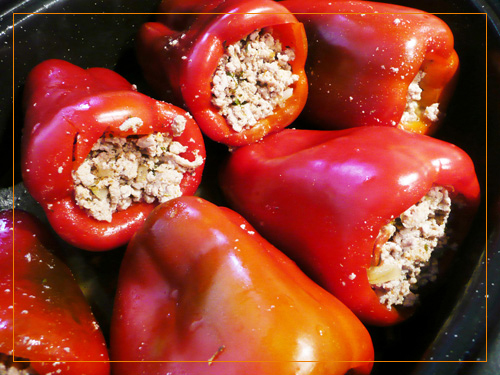 Bell peppers are obviously the main players so choose peppers of good size and enjoy this delectable dish. Cut the top of the red bell peppers carefully. Cut out the stems from the tops. Remove the seeds, and rinse well. Cook the onion in a frying pan for about 3 - 4 minutes and add the ground pork and Worcestershire sauce. Season with salt, pepper, and parsley and cook for about 8 - 10 minutes over low heat. Set aside. Fill in the peppers with the meat mixture. Preheat oven to 180 C or 350 F. Place the peppers in a roasting dish. Bake for 50 minutes. Add tomato slice on top of each pepper and garnish with parmesan. Bake for another 10 - 15 minutes, and serve. For your convenience we've created a visual guide to help you prepare this great family meal.